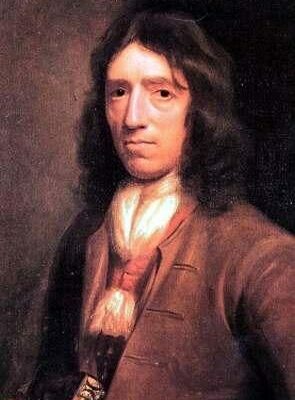 William Dampier was an English navigator, explorer, privateer and writer who lived from 1651 to 1715. He had numerous adventures around Central and South America and the Pacific, and in 1688 spent a short time in northwest Australia. Dampier’s careful charts, illustrations and account of his travels published in A New Voyage Around the World aroused the interest of the Royal Society and the Royal Navy. In 1697 Dampier was commissioned to explore the coasts of New Holland aboard HMS Roebuck. He arrived at Dirk Hartog Island in August 1699 and anchored at a place now called Dampier’s Landing and did not see the inscribed plate left by Willem de Vlamingh just two years earlier. Dampier explored the island and surrounding waters and noted Bernier and Dorre islands and the northern tip of Peron Peninsula, which he thought was an island. During this time Dampier’s cook, Mr Goodwin, died and became the first European known to have been buried on Australian soil. Dampier made many detailed observations of local wildlife and named the area ‘Sharks Bay’ in recognition of the large number of sharks in the area. He also made the first scientific collection of Australian plants. His collection is still preserved at the Oxford University and includes Dampiera, a blue-flowering genus that now bears his name. After a week in Shark Bay the Roebuck sailed north to the Dampier Archipelago, Roebuck Bay, Timor and beyond. Dampier had planned to explore the east coast of Australia, but the Roebuck leaked so badly he was forced to return to England. The ship sank at Ascension Island in the Atlantic Ocean but Dampier and crew were rescued just over a month later.